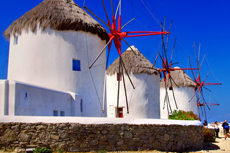 See the iconic Mykonos windmills up close, and treat yourself to a perfect view of the island while you're at it. We arrived at this port at about 8pm, and it got dark shortly after. Mykonas no need for a tour. Mykonas no need for a tour. Straight off the ship on to water taxi to main village. Just walk the streets and see the views. Keep an eye on time at all times. We felt nice and safe there. Mainly a walking tour round the town followed by a coach tour of the island. Mainly a walking tour round the town followed by a coach tour of the island. Viewed Delos from the beach. Paid 4 Euros each for roundtrip sea bus to prettiest part of town where locals were just opening shops & restaurants & shooing Petros, the local celebrity pelican, from store to shore. Walked to windmills. Mykonos is similar to Santorini only not all white. Mykonos is similar to Santorini only not all white. Very pretty with some stunning views. Mykonos: Understand that your schedule in Mykonos is very short. Part of the walking tour which itself was part of the island tour conducted by Antonio - a very competent and informative guide.